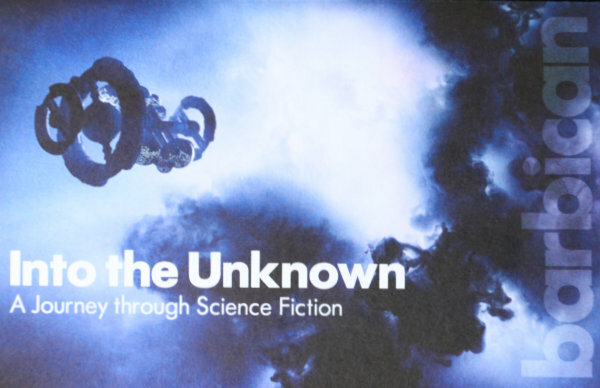 After asking for one adult for the Russian Revolution at the British Library I struggled a little to ask for one adult Into the Unknown at the Barbican or Into the Unknown a journey through Science Fiction to give it its full title. This exhibition has a great Start with a mix of books, film footage, props, models, interactive elements, audio, art, design sketches and other stuff. The first area is really well done and well worth a visit. Sadly they don’t finish the exhibition there. Instead there is then a showing of Porcelain an artist made science short fiction film (which I’d seen at the Bluecoat in Liverpool) and then an art installation of a robot arm with a light on it in the basement. So rather than finishing on a high note there are a couple of bizarre, disjointed sections that might work as free offerings alongside the main exhibition. Had they continued the main thrust of things in to a second area I’d highly recommend this but it just loses focus. It reminded me of the Designing 007 exhibition from a few years ago with a strong opening a good section on costumes and then a dissatisfying snow themed room in the basement at the end. It strikes me they feel the need to use all their space even if they end up with a poorer exhibition which is a great shame.